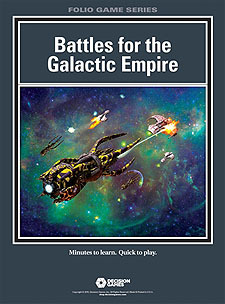 Battles for the Galactic Empire (BFGE) is a two-player game set in the Struggle for the Galactic Empire universe. Players attempt to outwit and outplay their opponent to achieve victory by scoring Chaos points through control of the six regions in the sector. Control of the regions is determined by skilful deployment of space fleets, action chit play, and tactical choices during combat. Players build their fleets choosing among six types with varying capabilities including military, morphogenetic (ability to convert opposing forces to the friendly side), and deployment/movement options. They pick chits randomly from five categories to enhance movement, tactical and build abilities, recruit special units, and disrupt opponent's plans.